A wedding day should be the happiest day of a bride’s life. Naturally, she wants the planning and the wedding to go smoothly and without a hitch of any kind. As a wedding planner you know there’s a lot involved in the planning process. There are so many moving parts that you need to get the whole thing under control right from the start. In particular, you need a realistic timeline in place early – like as soon as your client gets engaged! This is something that many wedding planners don’t advise on so it gives you a chance to stand out from the competition. 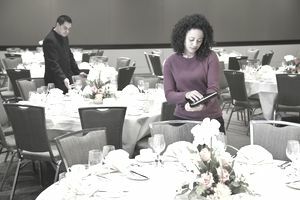 An unrealistic wedding planning timeline will cause a lot of stress, and of course, that’s the last thing you need as the wedding planner responsible for the success of the event. Advise your clients to insure the engagement ring. Not doing this could mean tears for the bride and groom! Settle on a budget for planning the event and other costs. Get this done early on so it helps to set realistic expectations for you and your clients. Work out two or three potential wedding dates. This will help you later on when you need to book the wedding day with your clients based on any number of things. Narrow down and check the availability of possible wedding venues. Check the availability of a wedding photographer – bear in mind many are booked over 12 months in advance. Check the availability of an officiant. During the engagement, some couples choose to set up a wedding website. This helps them keep everyone updated with venue and hotel information, dress code, a link to their gift registry, and more. After the engagement, your wedding planning timeline will most likely be a 12-month plan. To work it out, the first thing you need to do is list every single item you need to plan for the wedding, then slot each item into the right place in your timeline. 10-12 months – Decide on the number of guests and send out save the date cards. Once you know how many guests you’ll invite, book the venue. 6-8 months – Shop for the wedding dress, shoes, and accessories; book hotel rooms for out of town guests; and reserve music for the ceremony. 4-6 months – Order the wedding stationery, book transportation, and book the honeymoon. 2-4 months – Mail out the wedding invitations, discuss menu details with the hotel or caterer, and schedule a rehearsal time. 1-2 months – Buy the guest book, prepare the seating plan, and confirm the final guest count with your suppliers. 1 week – Finalize and confirm transportation arrangements, ceremony rehearsal takes place, and plan the reception seating plan. You can see how quickly a year will go and why an unrealistic wedding planning timeline could cause a lot of stress for you and your clients. Be prepared and always have a plan B in place in case of last minute problems. It’s all about getting organized and getting things in shape right from the start. By advising your clients about what to do during their initial engagement, you’ll have a happy couple and an advantage over your competition as well.